Durango Mountain Resort is putting on the Ritz for New Year’s Eve. Revelers can enjoy the “Torchlight Parade” that will wind its way down the slopes of Purgatory followed by a fireworks display. There will be an early bird, family-friendly “ball drop” at 10 p.m. at Paradise Pizzeria and Ice Creamery, which will also have a hot cocoa and s’mores bar for anyone who wants to get drunk on chocolate. For more adult fun, grab a drink and shake it to live music at Purgy’s Slopeside. Grab dinner before midnight so you aren’t toasting on an empty stomach. The resort is offering a fancy-schmancy sit-down New Year’s Eve dinner at the Durango Mountain Institute, which sounds like a school but is actually a former private clubhouse. There will also be a New Year’s Eve buffet at Hoody’s. For more information about all the New Year’s Eve happenings at Durango Mountain Resort or to make dinner reservations, check out the resort’s calendar of events. The Strater Hotel is a good bet on New Year’s Eve. The hotel’s restaurant, Mahogany Grille, will be serving a special prix-fixe New Year’s Eve dinner from 5-9 p.m. There will also be live music by Greg Ryder from 5:30-10:30 p.m. at the Diamond Belle Saloon and live music by Terry Rickard from 7-11 p.m. at The Office Spiritorium. 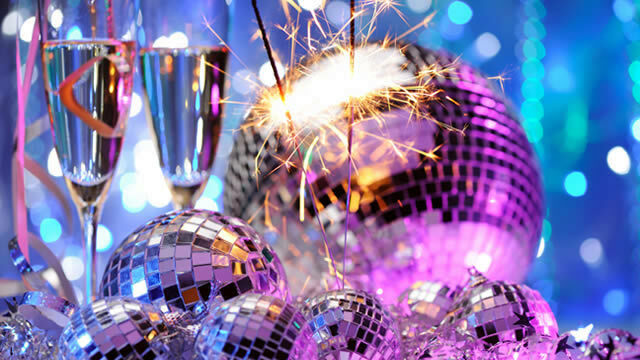 As if that weren’t enough, you can also ring in 2015 by partying like it’s 1999 during the New Year’s Eve Neon Dance Party at the Henry Strater Theatre. The shindig is a ’90s-inspired, neon-glowing dance-a-thon featuring live music by Hello Dollface. Doors open at 9 p.m. and tickets are $10 in advance, $12 at the door. You can celebrate the New Year on the rails one of two ways: riding the Polar Express on New Year’s Eve or catching the New Year’s Day Train. The Durango and Silverton Narrow Gague Railroad will run one of its Polar Express trains on New Year’s Eve if you’re looking for a family-friendly way to celebrate the end of 2014. The Polar Express, which runs through Jan. 3, will depart at 5:15 p.m. on Dec. 31 and will include all the usual fun: hot chocolate, readings from the book, and visits from characters on the way to the North Pole, including Santa himself. The New Year’s Day Train departs at 9 a.m., so be sure not to have too much fun the night before. Guests with first-class tickets will enjoy a catered hot brunch aboard the train and an on-board musician who will wander through the cars, playing tunes and taking requests. Standard-class passengers can buy food and drinks in the concession car and enjoy the views as the train passes through the Animas Valley. The train will make a 45-minute stop in Cascade Canyon, where passengers can stroll along the Animas River and warm up by a fire. The train will return to Durango around 2 p.m.
We hope you’ll be ringing in the New Year with us at the Durango Quality Inn. Book your room for next year today!